Destiny is a difficult game to review. It's difficult because it's hard to look past the sheer hype machine that Activision sent into operation to ensure that this project, which cost hundreds of millions to produce, is a commercial success. In other words it's so incredibly difficult to sit down and not look at it as a game that cost $500 million to make, market, and sell. The expectation going into Destiny really is that it will be the biggest game any of us have seen in our lives to date. By that standard, it was always going to be disappointing. But as critics we shouldn't be concerning ourselves with that hype machine. We shouldn't be judging a game solely because it looks like it cost hundreds of millions to produce. 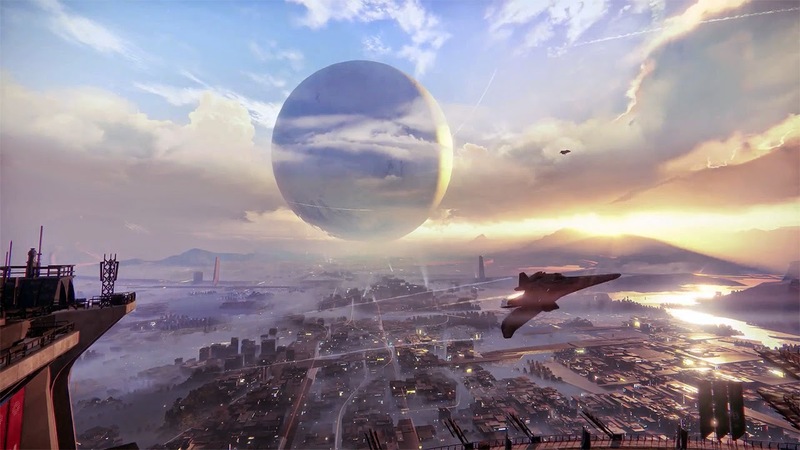 Destiny is a stunning game and the very definition of a blockbuster. But it somehow also manages to be a horribly bland game at times and it's very difficult to look at it and not think that Bungie and Activision could have used their money and apparently infinite resources better. Destiny wants to be epic. It looks to the stars and sees the opportunity for a sprawling adventure that jumps across planets and has spaceships, alien races, and all the other things we've come to expect from pulp science fiction. When the game starts we're immediately introduced to a humanity that has learned the secrets of space flight, and is spreading its tendrils slowly through the universe. Then it encounters a massive moon-like object called 'The Traveller'. This seemingly benign object is embroiled in an ancient conflict with The Darkness, a galactic evil that defies explanation and seems to be irresistible. The Traveller is losing its battle, and humanity, caught in the middle, has been reduced to a single city that ekes out a miserable existence within The Traveller's limited protective shadow. You, the player, are cast in the role as an unnamed Guardian - one of the special few with the capabilities to hold back the darkness. It could have been the basis of an enjoyable, if generic story. We've seen the Mass Effect trilogy do exciting stuff with a concept as basic. But with Destiny, what being a Guardian translates to is the ability to pick up a gun and shoot at stuff. As I was playing through Destiny's dozen hour campaign, I couldn't help but be reminded again and again what a wasted opportunity it really was. The gaming medium is perfect for science fiction. Through games we can explore impossible spaces, meet impossible people. The infinite possibilities of the universe should create infinite opportunities for player agency. To again point to Mass Effect: I was able to play a sociable hero or a nasty, violent killer. I was able to explore wherever I liked across a galaxy, or, if I wanted to, I could focus on the mission at hand. What Bioware understood was that the fundamental appeal of science fiction is the immersion of being able to look up at the infinite of space and realise that it is all now approachable. 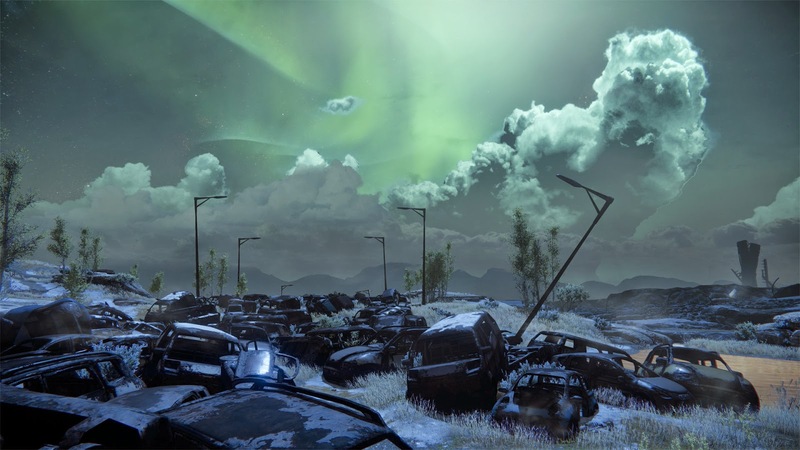 Destiny, on the other hand, features a limited few environments, and while players do get to leave earth after the introductory few hours and explore a limited section of space, there's only ever conflict out there. It's furthermore impossible to customise the story through interaction with other characters and enemies. It's a failing that is not a consequence of the genre; Mass Effect managed to be a "shooter" and still integrate interaction with non-hostile species and storytelling. Aside from an irritating robot with the most dialed-in performance that the talented Peter Dinklage has ever delivered (and he's done some terrible films, I can assure you), there was nothing in the world of Destiny that didn't want you dead. While this works in keeping the game's action and tension brisk throughout, it doesn't take long for what was meant to be an epic experience to generate into shooting stuff, getting loot, and then shooting some more stuff. The folks at Bungie seemed to be so focused on creating huge environments (and the environments are indeed huge) that they forgot that a good science fiction story is a fantasy, and most balanced people have an understanding of fantasy that extends beyond endless battle scenes. If Destiny has any kind of narrative or thematic depth, it's an unpleasant one that I would rather not dwell on too much: the game feels positively nationalistic at times. The last remaining human city is meant to be the sole surviving bastion of of good within a universe that wants to take it down, and at best we get mere glimpses into the cultures of these hostile alien races. For the most part they are unpleasant caricatures, and the narrative's attitude towards "foreigners" is far too reminiscent of nation states that lock down their borders and encourage a culture of xenophobia in their population. I don't like it when real-world nations encourage this behaviour, and I don't like it when games act as propaganda for such attitudes. To sum all of this up: if Mass Effect is a flight of fancy (albeit an epic one), Destiny is at times a limited if not unpleasantly semi-political statement, as conservative in the way it envisions a sprawling universe as the predominant attitudes that it expresses through its generally poorly writing. Without even looking at how the game plays, this is a big step back for Bungie, who had previously managed to do something quite interesting with the narrative of the Halo franchise. This limited vision for the narrative unfortunately flows through to how Destiny plays as well. 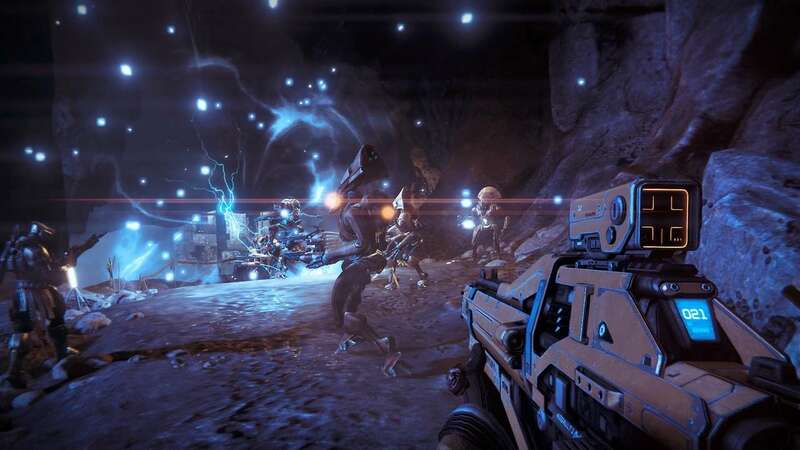 Unlike the squashed pathways that comprise the majority of modern-day shooters, Bungie was focused on building expansive environments that look more like a free-flowing and seamless MMO world than something more structured. This intention, while noble, is let down by those same environments being used over and over again. You'll pick a mission and be dropped into one of these "hubs," and then you'll need to traverse the environment to reach a building or other enclosed environment. And then Bungie further compromises its noble intentions, as these enclosed spaces do play out like virtually every other hyper-linear FPS created in recent years. The hub worlds themselves are actually quite dull, being populated with nothing but enemies and more enemies to shoot, and precious little interaction besides. Later on through the game the occasional super-powerful enemy will pop up, and a group of players will be needed to take him down, but as clever as it is to steal ideas from almost every MMO that has ever existed, it doesn't take long for Destiny's giant environments to feel like tiny, repetitive spaces. It doesn't help that interaction is limited within Destiny's world, either. There's a tiny few gestures that you can direct at random players that you come across. Before starting Destiny I would have thought that removing the chat box from an MMO-style game would be a Godsend as I would finally do away with the spam messages for "flaming swords at a bargain price of $1K". After playing Destiny I have realised that it's the occasional genuine conversation that you'll have in an MMO that makes for all the difference. Here, all you can really do is sit down or dance in front of people. It's possible to turn voice chat on for groups, but that functions no differently to any other FPS out there. 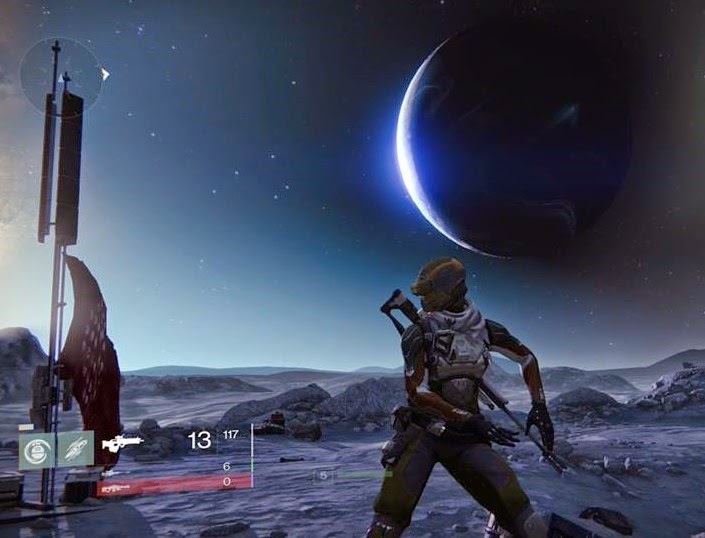 The MMO-side of Destiny is positively anti-social. This lack of communication impacts on the value of the one non-hostile space in the entire game, the city itself, where Guardians gather to buy new goods and pick up bounty hunts. Despite dozens of people being on the screen at any one time, this city is a lonely, quiet place, where no one talks to one another and rather runs off to the nearest shop to spend loot acquired through combat. Perhaps Bungie was making a statement about how real-world cities operate these days, but I quickly came to loathe returning to that city, so lonely and uninspiring as it is. JRPG developers long ago figured out that cities only really need to be menus unless you're going to make the city central to the plot. Bungie would have done well to emulate them there. With all of that said, Destiny's most enjoyable moments come from exploring with a couple of friends. Getting some co-op action going to take down an especially difficult monster or run through the game's gauntlet-like dungeons is genuinely good fun, though I do wonder whether it was simply that Destiny was facilitating social time with friends, rather than any kind of strength within the game itself. Nonetheless, as with many other games out there, if you are able to co-op your way through it and into the post-story content (of which there is plenty), then the value of Destiny does increase exponentially. In multiplayer it also matters less that Destiny has some odd technical quirks that shouldn't be present in the most expensive game ever. I say this as someone who is not an expert on the FPS genre, but someone who has played enough games to know that if I'm playing as a sniper class, and I need to use the scope just to make out the enemies far in the distance, then those enemies shouldn't be reacting to my presence like I was wandering up to them to offer them a beer. Further, when I'm in the hub world and the space around me is so gloriously open, it's not a good sign when the AI is content to hide behind a box that I have my scope targeted on, and not even try to send allies to flank me. As someone who really liked the Halo games, which were renowned for coming up with interesting enemy attack patterns, it fascinates me that somehow Bungie has managed to take a step back with the enemy AI. 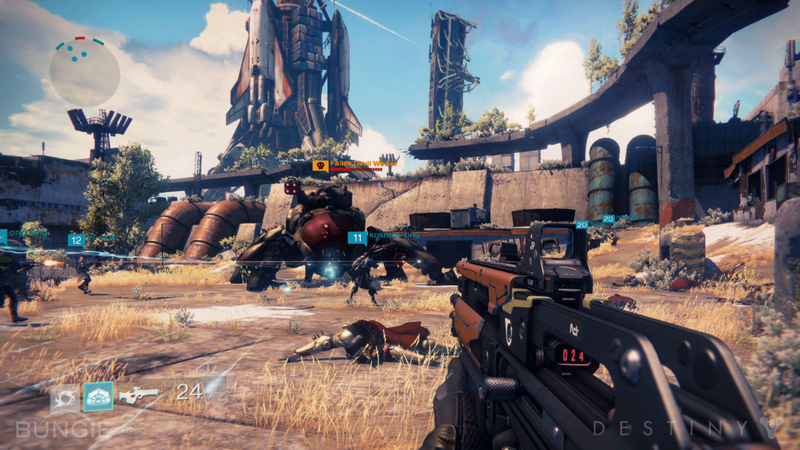 In terms of the competitive multiplayer, Destiny is superb and Bungie's heritage here is in full flight. I had a couple of connectivity issues when I was playing the game for review, but that's to be expected when the servers are so loaded. For the most part it did work, and I assume that it won't be long before it's a 100 per cent reliable experience. Levels are brilliantly balanced and it's in the multiplayer that Bungie's investment in creating nicely weighted and varied weapons is most evident. I'm certain that there will be a community that keeps this game's multiplayer alive for many years to come, just as I'm certain that many of the people who become serious competitive players in Destiny will forget the single player story well before they stop playing the game. I've rambled on a fair amount in this review, but here's my ultimate rub with Destiny: it doesn't do anything whatsoever to push the FPS, much less the games industry, forward. It's a deeply unintelligent and straightforward shooter that is utterly gorgeous to look at, and plays perfectly competently. At the same time it is something that I - and you, no matter who you are and how experienced you are at games - have played before in some form. There is innovation happening in the shooter space. Naughty Dog, or the folks who made Metro, are finding ways to ram some kind of brains into the often brainless shooter genre. But not Destiny. And for the sheer expense that went into making the game I don't think it's unreasonable to expect the game to do something for the development of games as an art form. Item Reviewed: Review: Destiny (Sony PlayStation 4) 9 out of 10 based on 10 ratings. 9 user reviews.